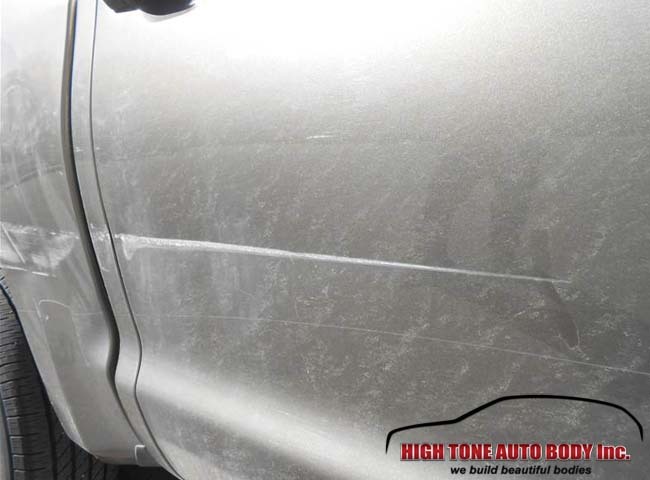 High Tone Auto Body can easily and quickly repair light damage to vehicles. 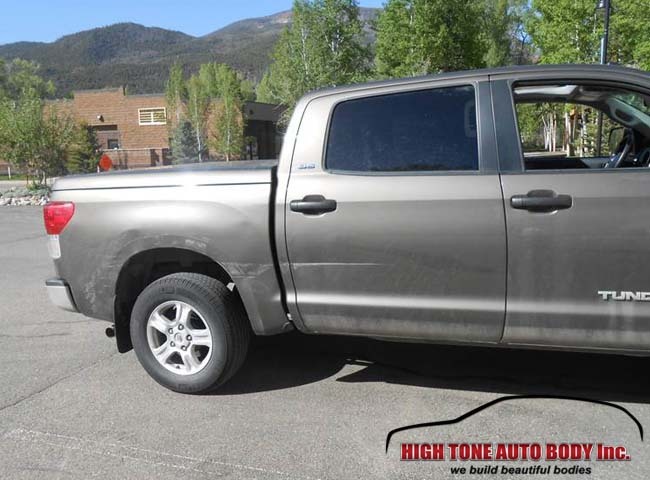 This late-model Toyota Tundra had some damage to the passenger’s side rear door, cab corner, and extensive damage along the bedside. 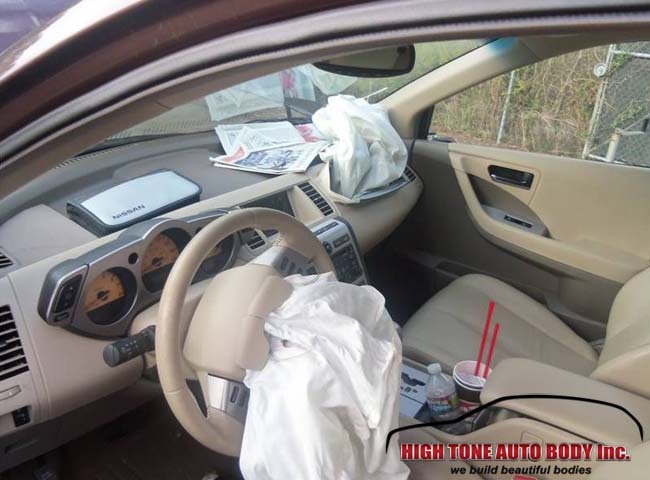 The paint was scraped off as well as extensive denting of the rear door and bed side during the collision. The good part about this damage is that it didn’t do any heavy damage to the frame or bend the overall structure of the truck at all. 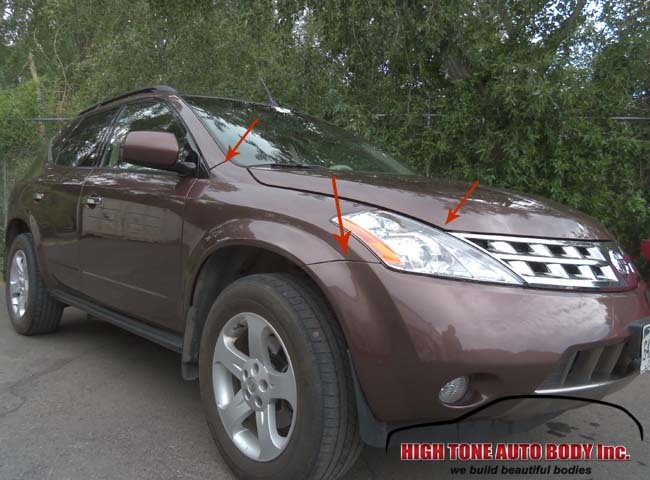 This type of damage is what you would refer to cosmetic damage because it ruins the overall eye-appeal of the vehicle, but the vehicle will run and drive normally. 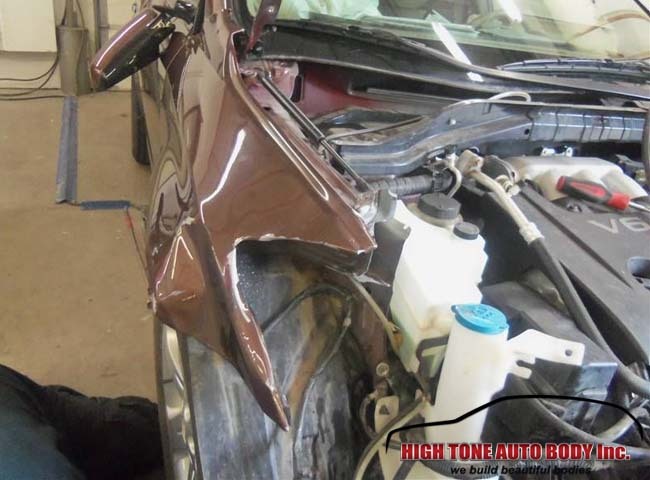 This is the most common type of auto body repair that an auto body shop will do. To start the repair we start with the door and cab damage. This repair is a deep scratch that dented in the panel of the door significantly. To fix this damage we need to sand off the paint and extract the dented areas on the door and bed cab with a special tool. 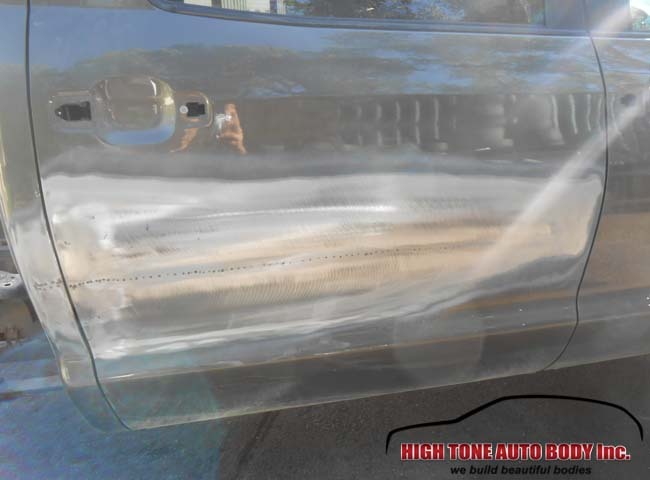 This technique helps us get the auto body work done in such a way that there is almost no need of any filler. Sub-standard auto body repair shops would have filled up the dent with filler, which is not a good way to do auto body work. 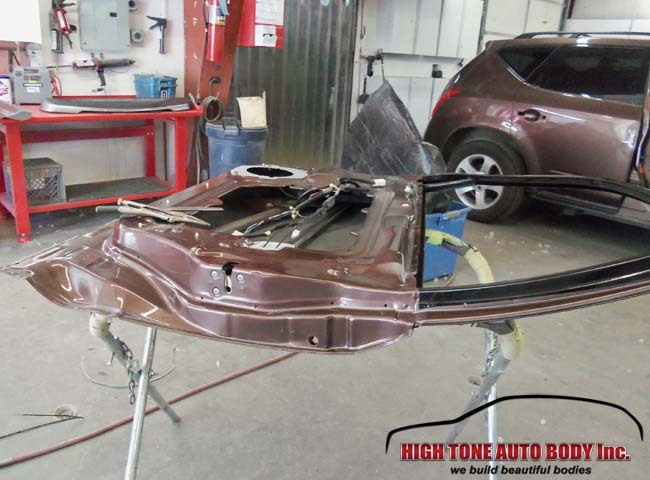 We at High Tone Auto Body make repairs the proper way. After the body work on the rear door and cab corner is complete, a technician sands down the surface to make it perfectly smooth and ready for a fresh coat of primer. After the primer has dried out, a few coats of matching paint get the looks the vehicle had before the collision. Finally, a clear coat is the final step. This coat will seal the paint and give the vehicle the sparkling looks it had before the collision. 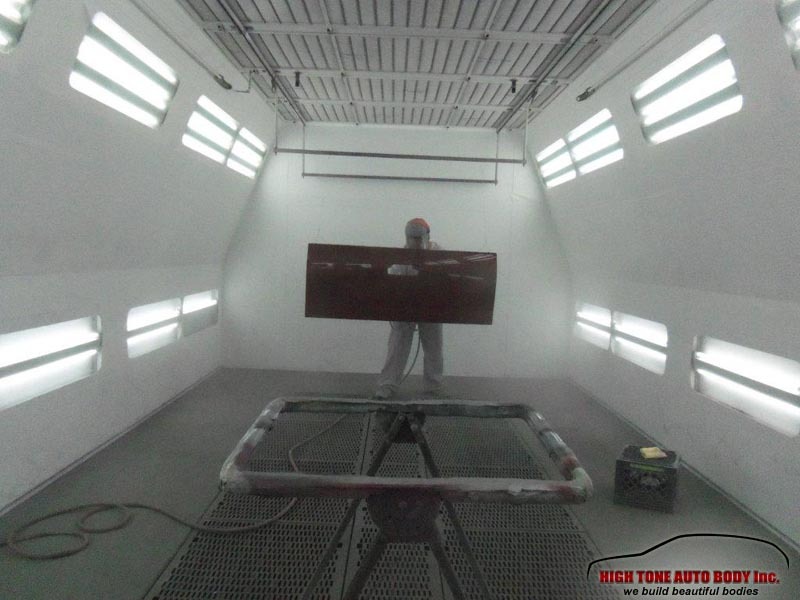 We usually do several coats of clear coat until the finish is perfectly smooth and shiny. While one team was working on the door and cab corner, another technician worked on the removed truck bed. The expert auto body technician removed the tail light housing and started preparation for the repair. The rest of the bed that was not damaged was masked off so paint overspray and dust don’t end up on the good area. Our tech started the repair by sanding the entire passenger’s side of the bed. He pulled out the damaged dented area and used almost no filler to smooth out the damaged area. Several sandings with fine grit sandpaper brought the damaged area to a perfectly smooth surface. After the sanding, a coat of primer prepared the surface for the base coat of paint. The base coat of paint was then sealed with several layers of clear coat until we achieved the perfect sparkling finish. 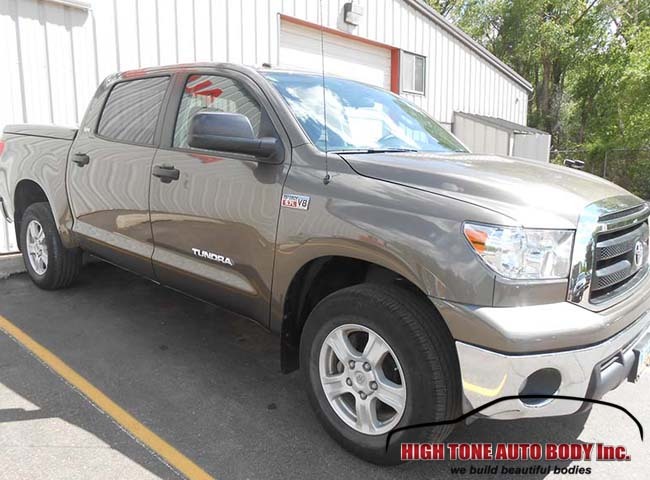 With the damaged parts repaired and painted, a team of technicians assemble everything together and the truck is back in the perfect condition that it was in before the damage occurred. 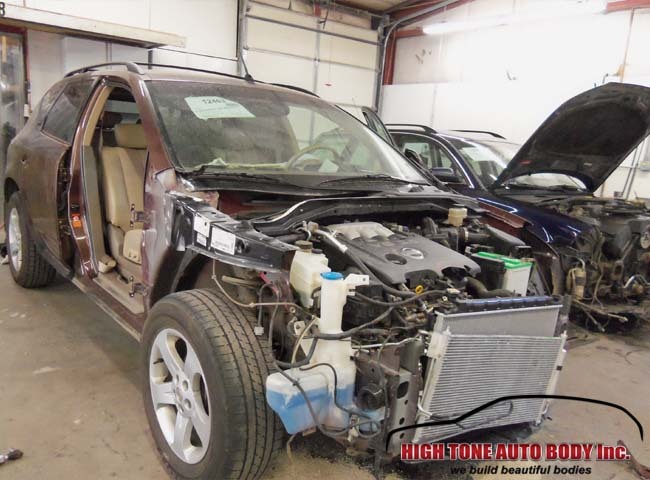 It takes an extremely talented auto body shop team with experience and formal training to complete a task that requires precision repair like we did on this almost-new vehicle. 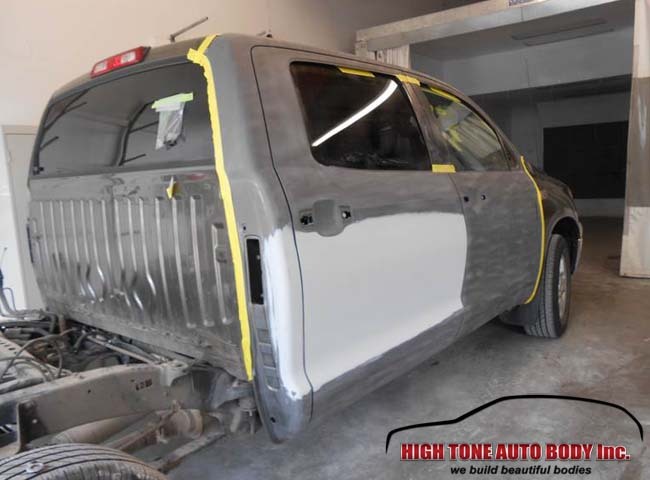 Everything from proper auto body work without excess use of filler, down to the clear coat spraying is a highly skilled work that we do here at High Tone Auto Body. The owner of this vehicle was extremely pleased with the results. Have you ever had a situation while pulling in your driveway, and you go one inch too far before making a turn and end up scraping the front left bumper? These minor accidents are very commonplace. They happen while pulling in or out of your garage, in a tight spot at the supermarket, or during parallel parking. Most of the times, these minor accidents end up causing some damage in the front-right area, usually the bumper, indicator lights and sometimes even the right headlight suffers. 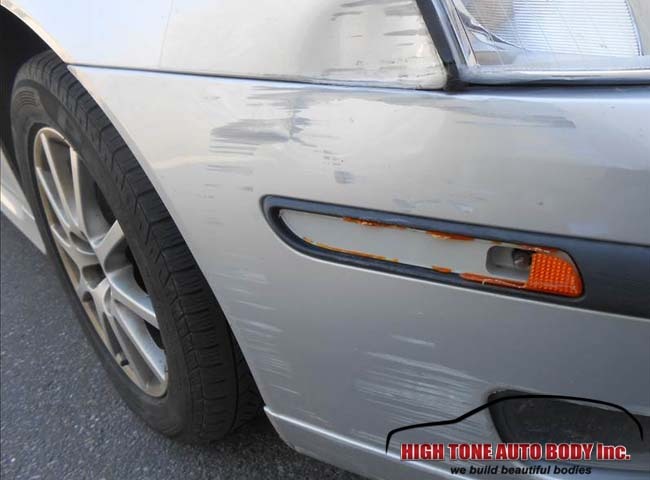 In this case, a silver Saab had this well-known damage: front right bumper and fender damage. 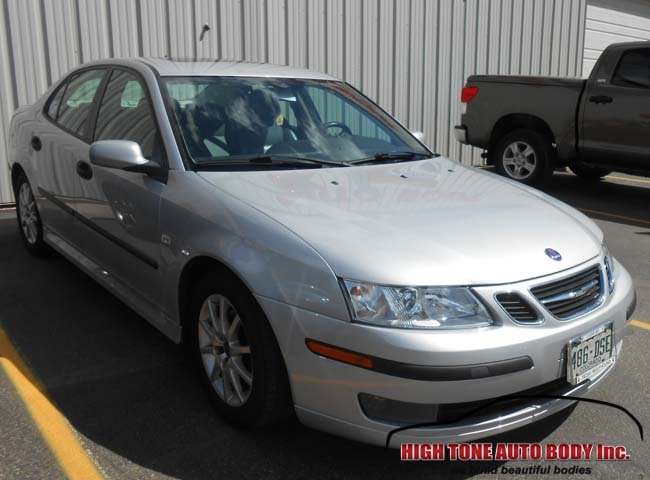 As the Saab has the indicator lights embedded in the fender, the right indicator was broken too. 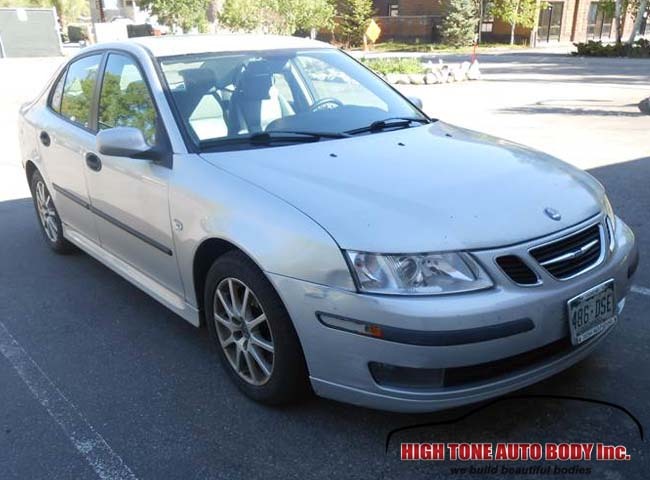 As you can see on the image below, the Saab damage is not as big as it could have been. None of the body parts are broken or damaged beyond repair. The headlight got away by less than an inch, and the indicator lightbulb is not broken, so there was no electrical damage. This driver got lucky. Indicator light broken and fender scratched. Headlight barely survived. To repair this damage, we replaced the indicaror, did some body work on the bumper and fender, and gave them a fresh coat of paint to restore the looks to the original, pre-accident looks. 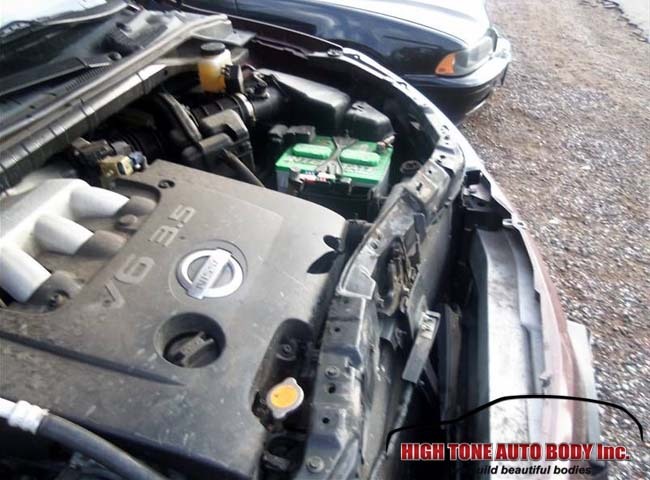 Thanks to our skilled technicians, this repair was done quickly and at minimum cost for the owner. The end result, as you can see from the image above, is flawless. Rarely a day goes by without someone, somewhere in the Aspen-Snowmass region experiencing the wildlife in Colorado a little bit too close. Especially during these winter days, wildlife encounters are all to frequent. Whether it is because of driving too fast, or because of driving through a particularly low-visibility situation, animals do get on the road, and we end up bumping into them. Sometimes it’s a minor scratch. But sometimes, animal collision can cause significant damage depending on the speed of travel. 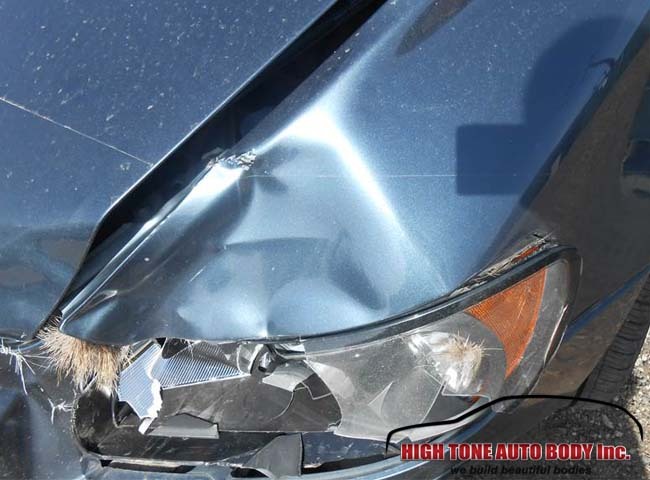 Animal collision auto body repairs can get quite expensive and complicated when you have to do all the paperwork to sort things out with your insurance company. 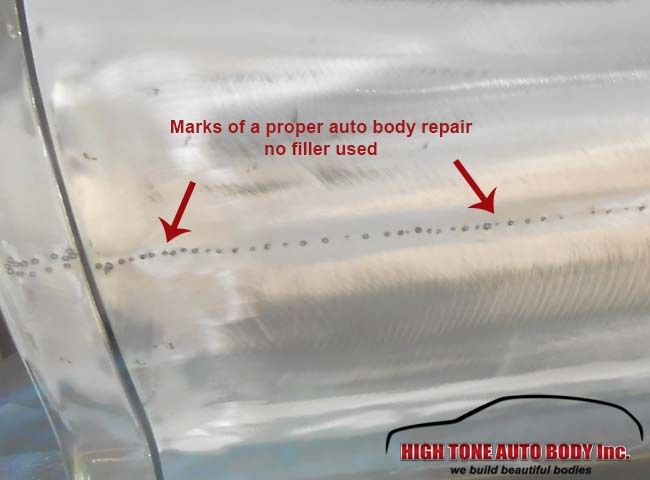 This is why we at High Tone Auto Body offer the complete service: paperwork and elbow grease. 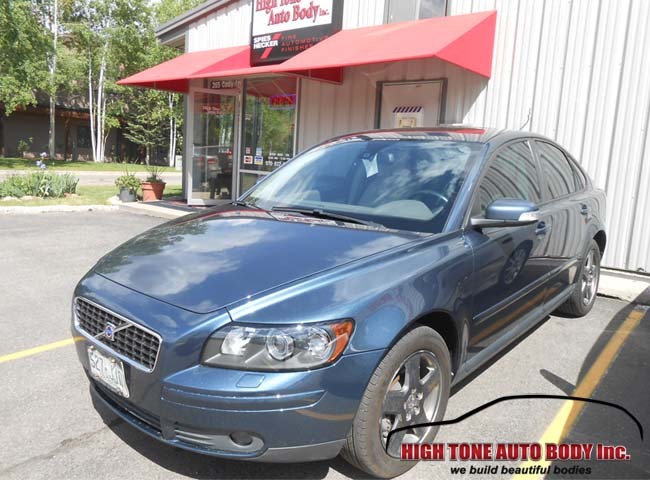 In the images below, you can see how a Volvo S40 front end got severely damaged from a deer collision. This Volvo S40 was damaged in a wildlife encounter. The deer walked away and the car had to be towed in. It doesn’t take much for a collision, especially when roads are slippery and wet. Even a 30mph speed is enough to cause significant damage when a collision with a large animal happens. 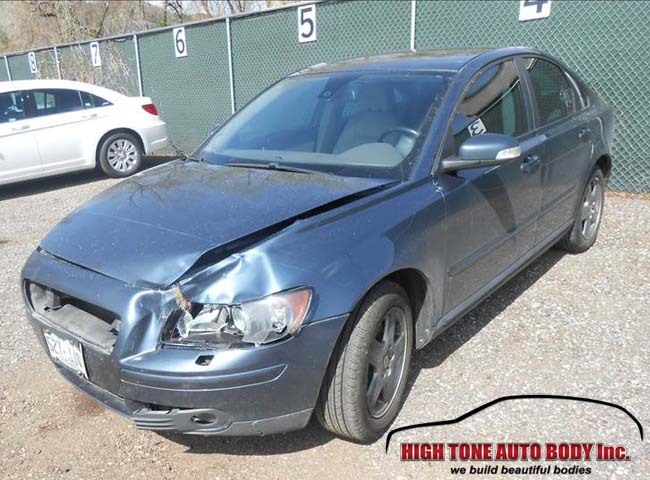 In this case, the deer collision caused significant damage of the front end of this Volvo S40. 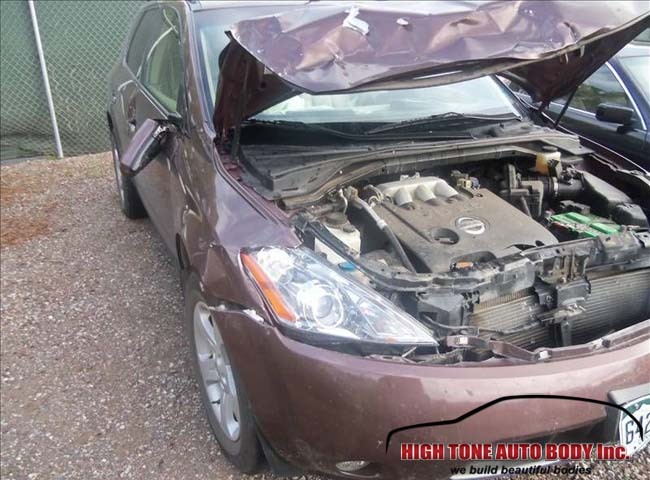 As the image below shows, the hood is deformed, the left fender is twisted and torn at places, and the headlight assembly is completely destroyed. The front bumper and grill also got some damage. The positive end of things was that none of the mechanical and electronic components of this car had any damage. The radiator was completely intact and the structural beams around the engine protected the wiring. Volvos are strong and sturdy vehicles. To do this repair properly, we removed the front bumper, hood and left fender. Then we replaced all the parts that needed replacing: front headlight, fog lights built into the bumper, new grill, new bumper, new left fender. While our tech’s were working on the vehicle itself, Tanja took care of all the paperwork with the insurance company. All in all, within a couple of days the owner of this vehicle had all the details sorted out, and the Volvo S40 looked like new. 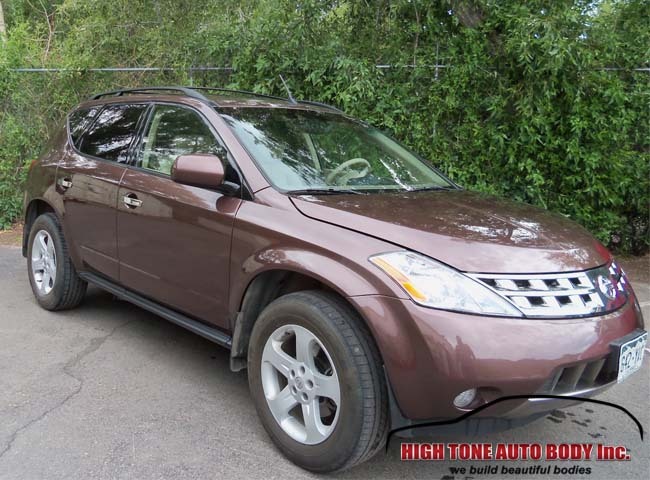 Thanks to our very friendly and competent staff, the repair experience was excellent. You may be the best and safest driver in the world and all it takes is a split-second distraction for the driver behind you to slam into your car from the back and cause extensive damage to your vehicle. This is exactly what happened to a middle-aged man. He stopped his pickup, waiting for a green light when another pickup truck rear ended him. The damage was extensive for both trucks. 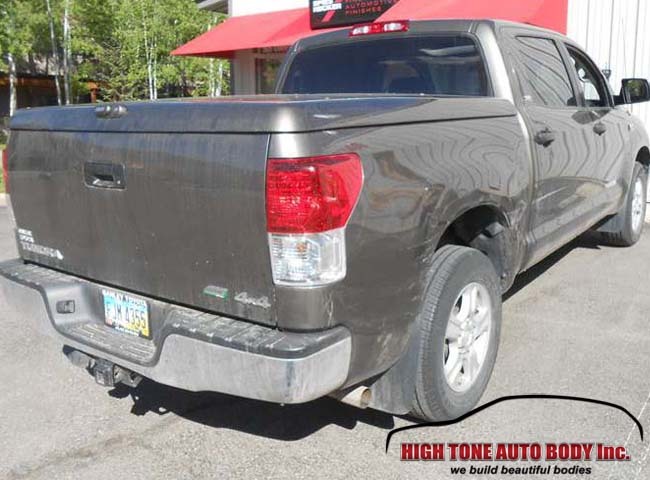 The cautious driver came to High Tone Auto Body for a complete repair of the tailgate and new rear bumper. The tail lights also needed replacement. While Tanja handled the insurance paper work the technicians in the auto body shop removed the damaged bumper, tail lights and tail gate. 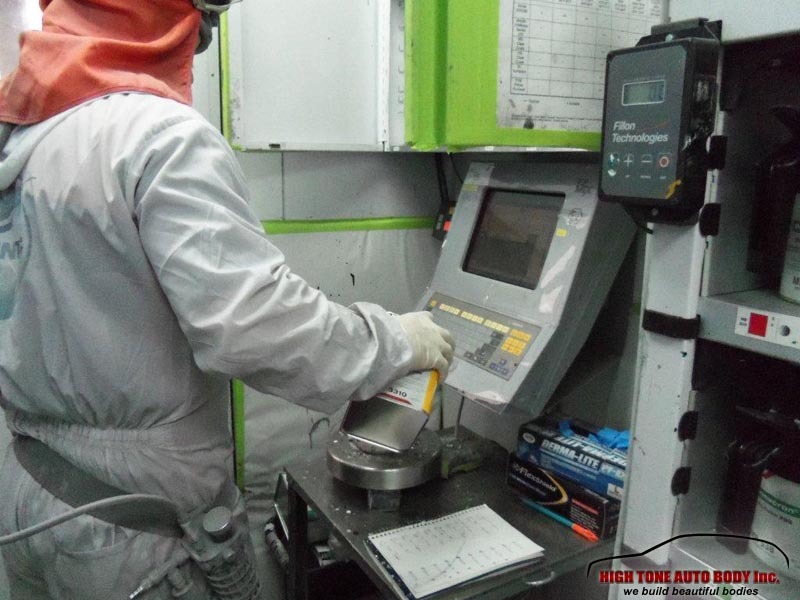 We use replacement Original Equipment Manufacturer (OEM) parts for a seamless fit. The new tailgate came in with an E-coat, black in color directly from the manufacturer. The new tailgate was cleaned with wax and grease remover, then sanded, cleaned again with wax and grease remover, then one coat of sealer was applied, followed by three coats of base coat red. Once the basecoat was flashed off, the protective clear coat was applied twice to ensure the proper millage (thickness) of clear for ultimate UV radiation protection. 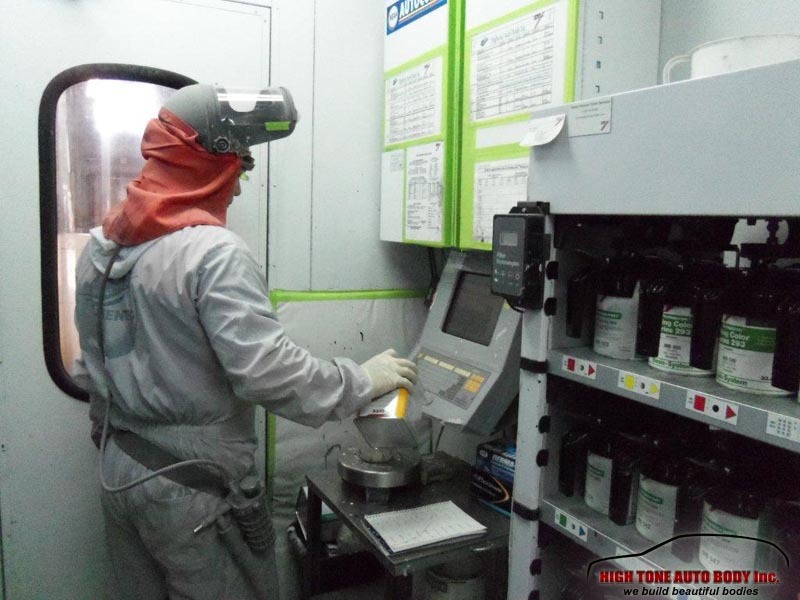 The painter weighs out the different components of toners, reducers and additives to come up with the exact color match to the customers vehicle. Each component is weighed to the gram. 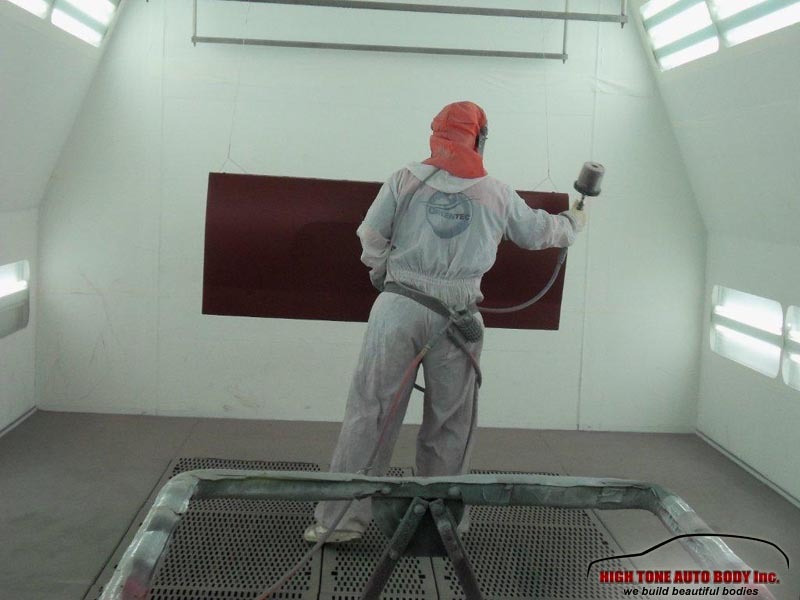 The painter can replicate any shade and color on any car on the market. 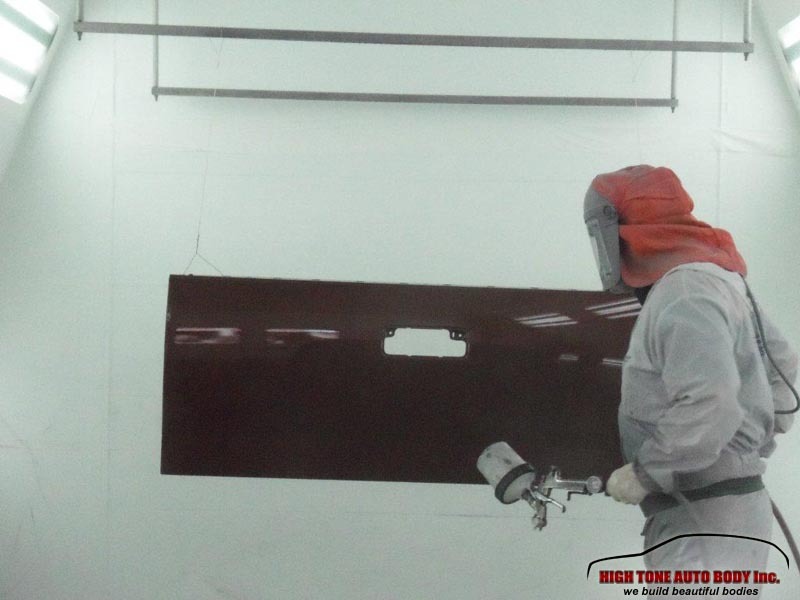 Once the paint toners were all measured by the gram on the digital scale, the paint technician mixed with appropriate reducer to make up the matching deep cherry red paint and was ready for spraying the panels. 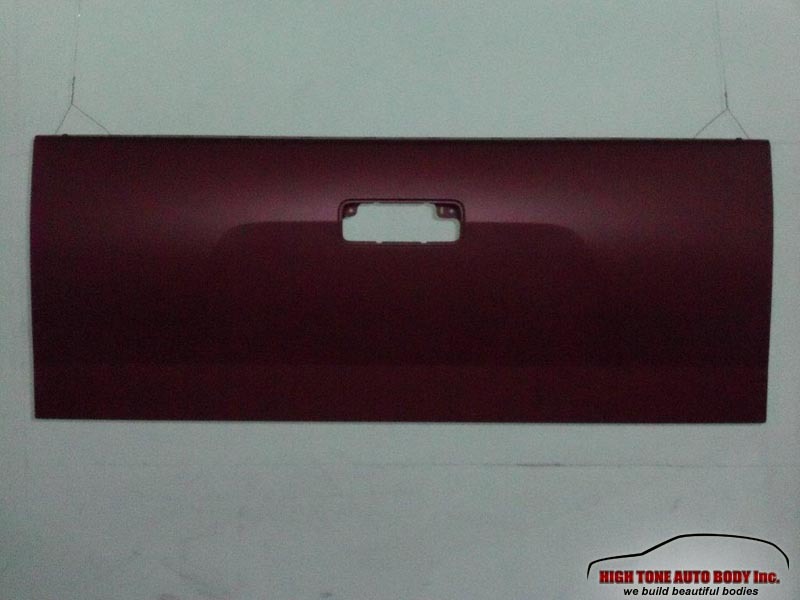 Components and base color mixed up to get the desired deep cherry red. 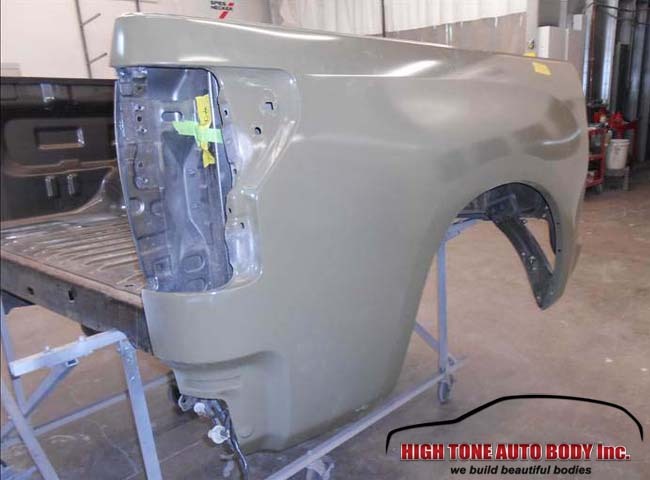 With properly mixed paint and the tail gate inside the downdraft booth, the certified paint technician was ready for base coat application to the tail gate. If the base coat paint layers do not get covered with a protective clear coat, the paint will quickly fade away. Without the clear coat there is no protection from the suns harmful UV rays. The added benefit of the clear coat is that it gives the paint a mirror like finish that also protects the vehicle from the elements. With the tail gate properly painted and clear coated after being baked, it was ready for installment on the truck. The finished repair took only a couple of days. The insurance covered all the repair expenses and the client left very pleased with the service and quality of work. Since then he referred several other clients for auto body and paint repair services.